Phycoerythrin conjugated Mouse anti Sheep MHC Class II DQ DR antibody, clone 28.1 (MCA2225PE) used for the identification of MHC class II expressing cells in bovine nasopharyngeal tissue sections by immunofluorescence. 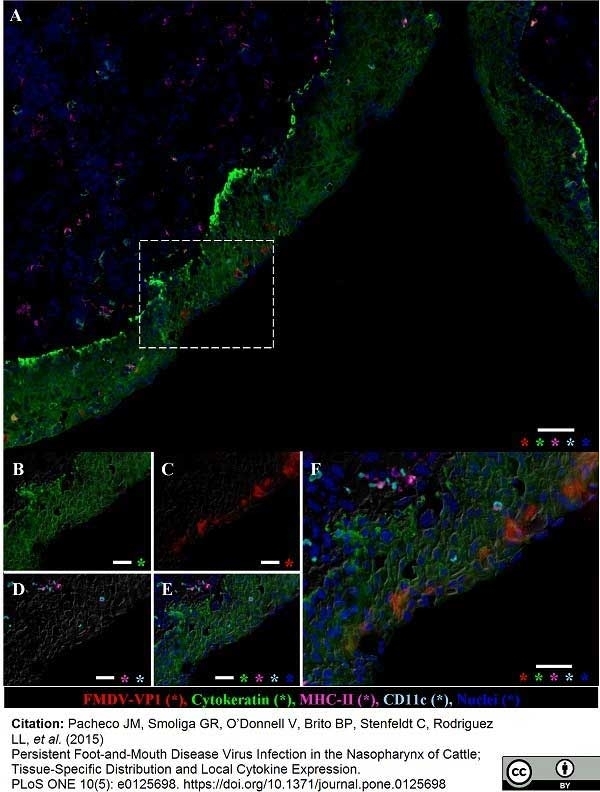 Immunofluorescent detection of persistent FMDV in nasopharyngeal mucosa. Dorsal nasopharynx, steer #626, 37dpe, FMDV O1 Manisa. Immunomicroscopy, A) Low magnification (10X) view of an epithelial invagination with a focal cluster of FMDV-antigen-positive cells within superficial epithelial surface, scale bar 50μm. B-F) Higher magnification (40X) views of region of interest identified in A (dashed box). Cells containing FMDV-VP1 are in the superficial epithelium and are cytokeratin-positive. 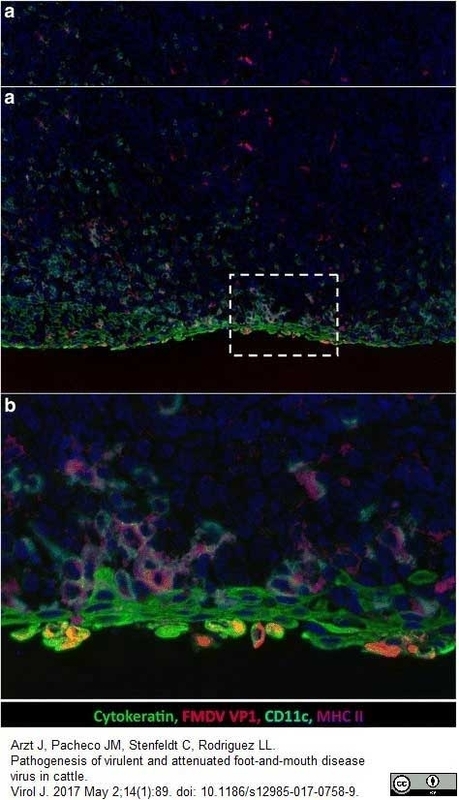 Few MHC-II and CD11c positive cells are present within and below epithelium, but do not contain FMDV-VP1. Indirect fluorescence technique with differential interference contrast, antibody labels color-coded in bottom panel, asterisks indicate channels present in each panel, scale bar 25 μm. Persistent Foot-and-Mouth Disease Virus Infection in the Nasopharynx of Cattle; Tissue-Specific Distribution and Local Cytokine Expression. Phycoerythrin conjugated Mouse anti Ovine MHC Class II antibody, clone 28.1 (MCA2225PE) used to evaluate MHC class II expression in palatine tonsil of FMDV infected cattle by immunofluorescence on cryostat tissue sections. FMDV generates microvesicles within the palatine tonsil of cattle during the clinical phase of disease. a Low magnification image demonstrates the architecture of a large tonsillar crypt delineated by cytokeratin-positive (green) squamous epithelium. Dashed box indicates region of interest (ROI) within crypt wall containing a focus of FMDV (red)-infected cells forming a microvesicle. ROI is featured at higher magnification in 6b-d including different detection channels in each panel. b Inclusion of FMDV VP1 (red) and cytokeratin (green) channels demonstrates disruption of epithelial architecture with cavitation/vesiculation. Many of the FMDV-containing cells are also cytokeratin-positive (epithelial cells). c Inclusion of FMDV VP1 (red), CD11c (turquoise), and MHC II (purple) demonstrates that some of the FMDV-containing cells are also individually- or double-positive for these markers of monocytoid, phagocytic, and antigen presenting cells. d Simultaneous viewing of all 4 channels demonstrates that within the vesicular cavity, FMDV-containing cells of distinct phenotypes are interspersed and in close proximity. Multichannel immunofluorescence microcopy. (animal ID 938, tissue ID palatine tonsil) (magnification: a 4×, b-d 40×). From: Arzt J, Pacheco JM, Stenfeldt C, Rodriguez LL. 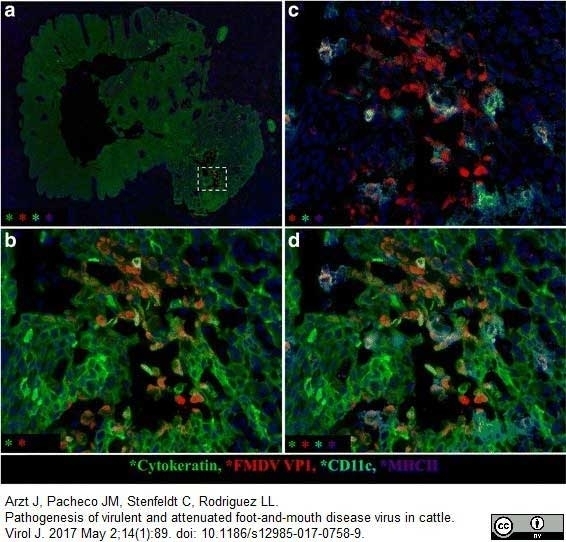 Pathogenesis of virulent andattenuated foot-and-mouth disease virus in cattle. Virol J. 2017 May 2;14(1):89. Phycoerythrin conjugated Mouse anti Ovine MHC Class II antibody, clone 28.1 (MCA2225PE) used to evaluate MHC II expression on CD1b+ ovine lymph cells by flow cytometry. Mouse anti Sheep MHC Class II DQ DR antibody, clone 28.1 recognizes a polymorphic epitope on ovine MHC class II DQ and DR molecules, which are constitutively expressed on antigen presenting cells such as dendritic cells, B lymphocytes, monocytes, macrophages, activated T lymphocytes and may be induced on a range of other cell types by interferon gamma. The major histocompatibility complex (MHC) is a cluster of genes some of which are important in the immune response to infections. In sheep, this complex is referred to as the ovine leukocyte antigen (OLA) region. There are 2 major types of MHC class IIa molecules encoded by the OLA which are DR and DQ each composed of an alpha and beta chain. Mouse anti Sheep MHC Class II DQ DR antibody, clone 28.1 recognizes ovine MHC II transfectants DQ - T28.1, DQ - T26.2 and DR - T31.3 but not DR - T8.1. (Ballingall, K. et al. 1995). Where this antibody has not been tested for use in a particular technique this does not necessarily exclude its use in such procedures. Suggested working dilutions are given as a guide only. It is recommended that the user titrates the antibody for use in their own system uising appropriate negative/positive controls. Puri, N.K. et al. (1985) Sheep lymphocyte antigens (OLA). II. Major histocompatibility complex class II molecules. Arzt, J. et al. (2017) Pathogenesis of virulent and attenuated foot-and-mouth disease virus in cattle. Virol J. 14 (1): 89. Puri, N.K. et al. (1987) Sheep MHC class II molecules. I. Immunochemical characterization. Ballingall. K. et al. (1995) Analysis of the fine specificities of sheep major histocompatibility complex class II - Specific monoclonal antibodies using mouse L - Cell transfectants. Olivier, M. et al. 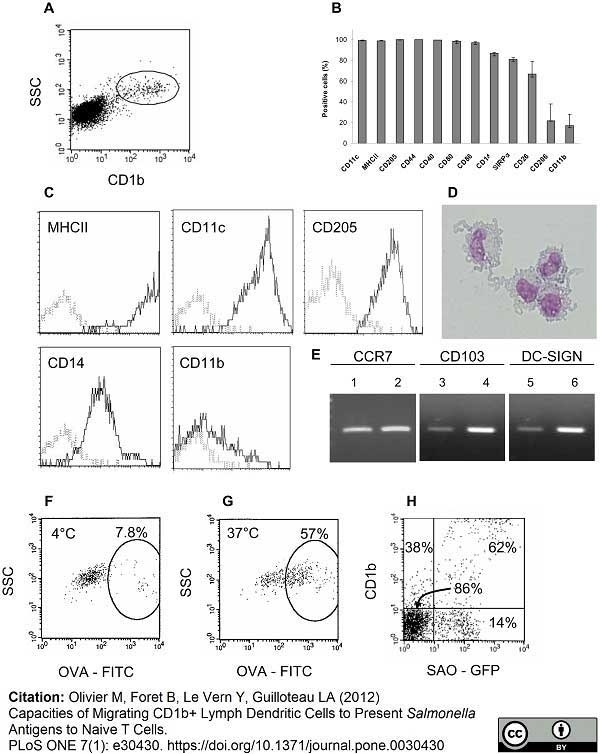 (2012) Capacities of Migrating CD1b Lymph Dendritic Cells to Present Salmonella Antigens to Naive T Cells.